The Alien Federation includes Shock Troopers, Jumpers, Loor, and Stealth Troopers. 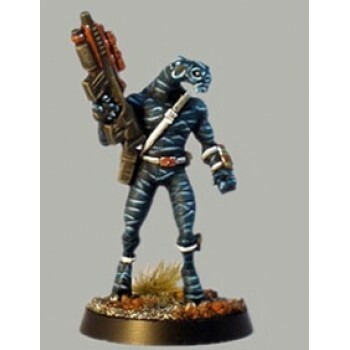 28mm Alien commander with data pad (1 Figure) Multi-part figure..
28mm Alien Major (1 Figure) Multi-part figure. L-R Standard helmet & alternate alien head,..
28mm Alien Shock trooper sniper (1 Figure) Multi-part figure..
28mm Alien Shock trooper sniper II (1 Figure) Multi-part figure..
28mm Alien Shock trooper with heavy weapon II (1 Figure) Multi-part figure..
28mm Alien Shocktrooper with heavy weapon (1 Figure) Multi-part figure with 2 head designs, Painted ..
28mm Alien trooper advancing (1 Figure) Multi-part figure..
28mm Armoured shoulder plates (8 Shoulder Plates) Designed to convert our alien troopers into elites..
28mm C'crysh shocktrooper (1 Figure) Multi-part figure with 2 head designs..
28mm Death-bot (1 Figure) Multi-part figure, please note skull painted on by painter..
28mm Death-bot II (1 Figure) Multi-part figure..
28mm Dylothian shocktrooper (1 Figure) Multi-part figure with 2 head designs..
28mm Federation Shock Troopers Squad A (5 Figures) Combo pack includes each Federation Shock T..
28mm Federation Shock Troopers Squad B (5 Figures) Combo pack includes each Federation Shock T..
28mm Federation Shock Troopers Squad c (5 Figures) Combo pack includes each Federation Shock T..
28mm Garr (1 Figure) Multi-part figure..
28mm Gobarite shocktrooper (1 Figure) Multi-part figure with 2 head designs..
28mm Hent shocktrooper (1 Figure) Multi-part figure with 2 head designs..
28mm Human trooper (1 Figure) Multi-part figure..
28mm Kurabian shocktrooper (1 Figure) Multi-part figure with 2 head designs..
28mm Loor scout (1 Figure) Painted figures by Figouze..
28mm Loor scout advancing I (1 Figure) Painted figures by Figouze..
28mm Loor scout advancing II (1 Figure) Painted figures by Figouze..
28mm Loor Scout group (5 Figures) Painted figures by Figouze. Combo pack inc..
28mm Loor scout tracker (1 Figure) Painted figures by Figouze..
28mm Loor scout with heavy weapon (1 Figure) Painted figures by Figouze..
28mm Lord of Xaam shocktrooper (1 Figure)..
28mm Majalan shocktrooper (1 Figure) Multi-part figure with 2 head designs..
28mm Nabh shocktrooper (1 Figure) Multi-part figure with 2 head designs..
28mm Ogryn Heavy Trooper (1 Figure)..
28mm Ovolvo shocktrooper (1 Figure) Multi-part figure with 2 head designs..
28mm Stikk (1 Figure) Multi-part figure..
28mm Tabili shocktrooper (1 Figure) Multi-part figure with 2 head designs..